Namco Bandai's idol simulator is taking the Japanese mobile game market by storm and burning holes in players' pockets. The Idolmaster game series is well known among Japanese gamers for its cute virtual girls and plethora of costly DLC. Now it seems the mobile phone version of the game, Idolm@ster Cinderella Girls, (better known among its users as "Mobamas") is doing a better job than any of its console predecessors at scooping up money from players. The game basically functions like a collectible card game: Player pay 300 "Mobacoins" (At ¥1 (US$0.012) per Mobacoin) to draw a random idol that they train and compete with. 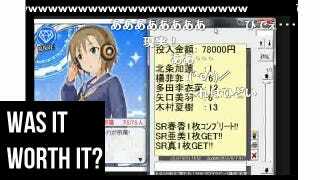 Some idols have better stats than others, if certain specific idols are collected, they form a set with bonuses, and then there are special super rare cards-I-mean-idols that have some players emptying their wallets over. Namco Bandai Is Ripping Off a Japanese Clothing Store?